My “Glob-Trottoir” (French for sidewalk snot) is getting stripped and re-done. Not for going anywhere, but for staying-put. 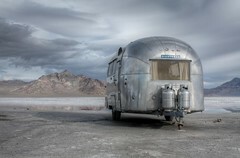 PS this pic isn’t my little airstream, it’s Brad’s–a stranger–whose flickr picture caught my attention. That photo on the Bonneville salt flatz utterly captivates me. ~ by jacquiephelan on February 3, 2010. I’ve got some land on the ocean why don’t you come plunk it here in Nova Scotia? Jacquie, that you so much for the post! the photo is awesome – and the family has greys!! and dedicates the whole back of their car to them (just like me). Thank you for my sunday mornN diversion. PS your blog is super creative! HUMMM “that = thank,” baaaa maybe i should of said “Wombat’s you so much” anyways my wheels came off when i saw the pix.